EU Member State scientific support is critical for the normal functioning of the EU food safety system. National food safety authorities give EFSA strategic advice on scientific issues and are the most important contributors of experts to EFSA. National bodies provide the essential data used in EFSA’s scientific assessments. Competent organisations in Member States carry out most of the scientific projects EFSA commissions. EU Member State public information services and communications experts work with EFSA to disseminate the results of EFSA’s assessments, promote engagement and attract scientific experts. These networks are particularly critical during food-related emergencies. EFSA’s Advisory Forum comprises representatives of the national food safety authorities of the 28 EU Member States, Iceland and Norway. Each national authority is responsible for risk assessment of the food chain at national level although the exact roles may vary by country. Observers from Switzerland and the EU Candidate Countries also attend Advisory Forum meetings. The members of EFSA’s Advisory Forum signed a Declaration of Commitment at the forum’s 61st meeting on 28 September 2016 in Bratislava in which they agreed on a range of measures and activities that will ensure that EFSA and Advisory Forum members can together meet future challenges in the area of food safety and so protect European consumers. Focal Points act as an interface between EFSA and national food safety authorities, research institutes and other stakeholders. 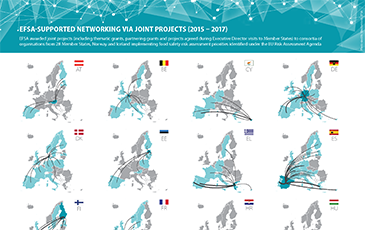 The Focal Point network comprises members from all 28 EU Member States, Iceland and Norway, as well as observers from Switzerland and EU candidate countries. 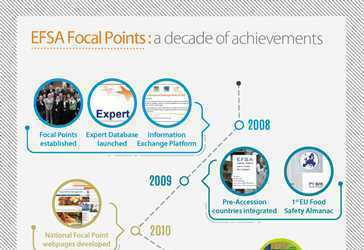 EFSA and the Focal Points usually meet four times per year ahead of Advisory Forum meetings. They report to EFSA annually on their activities: until 2013 in Focal Point Activities Reports, since 2014 in EFSA’s Scientific Cooperation Reports. EFSA coordinates several networks of nationally appointed EU Member State organisations with expertise in specific scientific fields (e.g. emerging risks, pesticide residue monitoring). Representatives of the European Commission and of other organisations, including from outside the EU, with specific expertise may be invited to join an EFSA network. The networks facilitate scientific cooperation by coordinating activities, exchanging information, developing and implementing joint projects, and exchanging expertise and best practices.